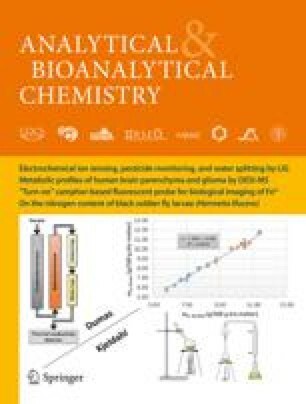 An atrazine flow-through fluoroimmunosensor was developed, based on an oriented antibody covalently bound to Protein-A (Prot-A) immobilized on Controlled Pore Glass (CPG). Atrazine was detected “in-situ” by placing the immobilized antibody in the optical path of the flow cell. Immobilization of 30 μg of polyclonal anti-atrazine antibody on 0.5 g of Prot-A-CPG provided the highest sensitivity. The effect of several solvents on the covalently immobilized antibodies regeneration was evaluated, the optimum conditions being achieved by pumping 5% acetonitrile (pH = 3) at 0.15 mL/min for 100 s. The detection limit of the immunosensor was 0.7 μg/L and the reproducibility was 2% and 4% for 5 μg/L and 40 μg/L, respectively, in the optimum working concentration range (0.7–50 μg/L). This device allowed 12 samples per hour to be analyzed and had a life-time of 200 assays. Simazine and desisopropylatrazine (DIA) were not cross-reactive, desethylatrazine (DEA) has a cross-reactivity of 8% and propazine and prometryn of 44% and 27%, respectively. The immunosensor was applied to the determination of atrazine in tap and ground water samples spiked at the ¶10 and 30 μg/L concentration level.